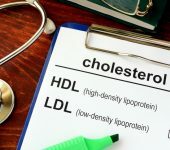 As High Cholesterol continues to rise as a major risk factor in the USA, the attention to understanding it along with the training parameters recommended by the experts is becoming more and more important. In whatever capacity you fit in the Fitness Industry, learning the basics on Cholesterol along with the main key fitness applications that help lower it is of up-most importance. As a Fitness Salesperson, this course will assist you in having the confidence to speak and educate a prospective client on the many positive and negative functions of Cholesterol in the human body and how a personal program designed exclusively for them will help them lower or prevent unhealthy cholesterol levels. As a trainer, you will learn the science plus a sequence of science based programming parameters to use as the building blocks to create safe and result producing workouts. This course is available as both a pre recorded webinar or at select locations and dates around the country if listed bellow on the enrollment form.